Yesterday we raised the plank! Yes, we went up to 800mm and I had about 70% leaping. Which isn’t that bad, really, but it’s still like: wahhhhhh, where’d my beautiful running go? Penny says this is very normal and that Badger did the same thing every time she raised the plank, for 2-3 sessions. So I feel ok now. Also she is wrapping and doing things very nicely. I like her. Sunday (today) I decided to take them (her) lure-coursing. For those of you who don’t know, there’s a field and they set up a little course (it was just a square today, I’m not sure if there’s usually more twists and turns?) with wires on the ground and a plastic bag attached to the wires. A man runs a motor which makes the bag zip along the ground like a rabbit. You can go on YouTube and search ‘Lure coursing’. 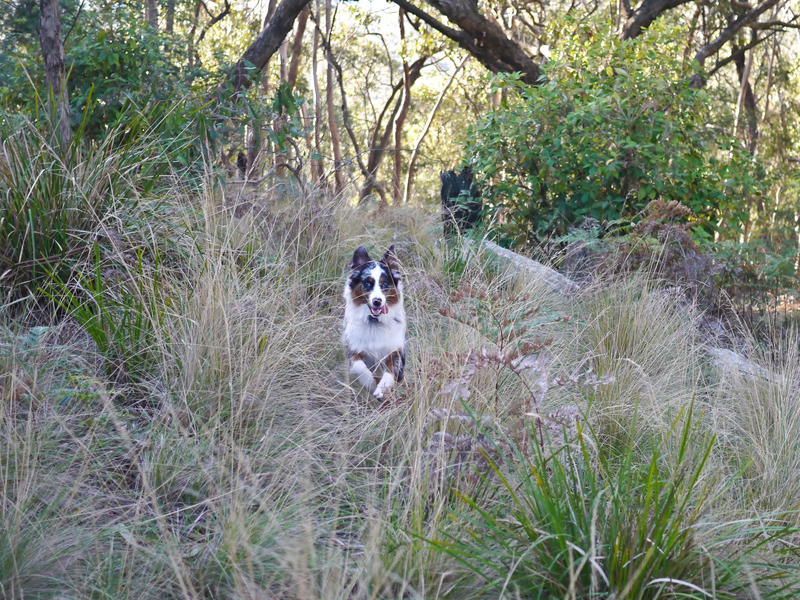 Anyway, I’d tried it a long long time ago with Mal and he said: “YAY I CAN CHASE…!” and then very quickly realised he was all alone and way too far away from me and came running back and didn’t leave. Sigh. Lumen though, I figured a) loves chasing, and b) loves running off on me to chase things. We also brought Panshanger along because she’d done it before and was a sighthound sort of and was going to be the expert and they were going to get all competitive and stuff. Sigh. (you can see what happened with that plan in the photos). Meanwhile, if you ever want lots, and lots and lots of photos of your dogs running full speed with fierce intensity, take them lure coursing. I had 600+ photos to filter through and all of them great examples of Lumen running full speed which, if you’ve followed my blog for any longer than a week, you’ll know I’m a little obsessed with running photos of my dogs. I just think they look so cool and athletic and majestic. I can’t help it. It’s a problem. In fact, I got so many photos today that when we go again I don’t know if I’ll bother with the camera. Mal actually went in with Lu on her 3rd turn and at first he was just chasing her but in the end he did all 3 laps and didn’t worry about me- I think all the hiking where he’s beginning to go further and further without me has really helped. Tomorrow they’re seeing a guy who does T-Touch and a bunch of other weird-sounding therapies because I want to make sure they’re ok and also for some reason I’ve become totally paranoid (become?!) and convinced that Lu is sore, possibly in the back. She’s probably not but I have to have something to obsess about. Also the woman who reccomended him to me says she noticed heaps of changes in her dogs when they go, both positive behavioural changes, and also in her young dog’s jumping style- that she got easier, wrapped better, extended more, etc etc. Sounds good to me! Anyway, enjoy another batch of photos of Lumen running, this time while chasing a plastic bag. (and also some other stuff). Release the hounds! At this point, Shangs is like: Yeah! Ima get it!!! A very streamlined dog. Possibly after a corner, which is why she looks weird. Wait, wait, wait! It went in there I know it did!!! Hey, hi, I know you’ve got the rabbit thingie and I’d like you to make it go again plsthnks. This is the most handsome ninja dog I know. Seriously. Check out his majesty right now. Release the hound!!! I recon this would be a great way to practise: “ready, ready… GO!!!! !” in a way that would really help her understand that “GO!” means cool stuff is gonna happen and get her in that chasing frame of mind. Pan’s turn! Look, Penny! She looked like she was actually going to chase it for a minute there! Pan promptly exits the scene of confusion and anger. Then Mal had a go. For much of the turn I suspect he had no idea what was happening. Here, he was just running with Lu. You can see her looking to the side trying to get him out of the way so she could chase the lure. Then Mal spent much of the go running smaller circles on the inside of the course in an attempt to keep up with Lu. A very long, streamlined, flat-back dog. Mal has some catching up to do. C’mon Mal, RUN you fool. (actually last night and this morning I was pretty convinced he was dying of cancer or Cushings Disease or something because he was very lethargic and sad, and wouldn’t even EAT when I gave him a fish, but when we got to the park he was normal so I guess he’s ok). So, amazingly, even though Lu has been in season for the last 2-3 weeks, nothing much has changed around here. Call me irresponsible, but I’ve been going to the Field and taking her out to secluded bush places around town… so far, I’ve not seen a single other dog interested in her. Except for Mal, who, despite being desexed and having never had ANY clue about what ‘it all means’, has not been able to keep his nose out from under her tail for the last 3-4 days. Yuck. Anyway, the torture is nearly over so soon we’ll be able to run with The Pack again without worrying about making Whizzies or Australian Collies. Today there was a distinct possibility of Australian Dingoes, which would have been interesting, but she was on lead, so it was ok. Yesterday we headed up to a pine forest, which I always like because there’s really limited animal populations in pine forests, so I can kind of relax on the whole ‘my dog is going to run off chasing things’ thing (unless you’re Penny who apparently doesn’t need to worry. Maybe Lu can teach Badger how to hunt, too, since she taught him to use his nose so well…). But… pine forests are just… forests full of pine-trees. Not the most interesting photographic fodder. So today, for fun, we headed back to where we found snow with the pack, knowing full well there’d be no snow but wanting to check out the scenery and the little meadows and such anyway. Lovely Mal coming to check in. Mal channeling the Lion King? Step 1 of a Lumen leap: Leap normally. Step 2 of a Lumen leap: abort abort! Land suddenly with all 4 legs down like an aeroplane. Dogs that wait for sticks. However, this weekend saw us enter our very first dog show. Considering it was our first one, Lu did really, really well. She was super focused while in the ring, stood still, didn’t start shaping when we had to wait around, and got all wiggly for the judge (as opposed to shying away, which is what her mum would do). So, I was happy with that. We didn’t win our class but it’s ok. I’ve also now ‘done’ the show thing and can pretty confidently say that I don’t have much interest in doing it again. 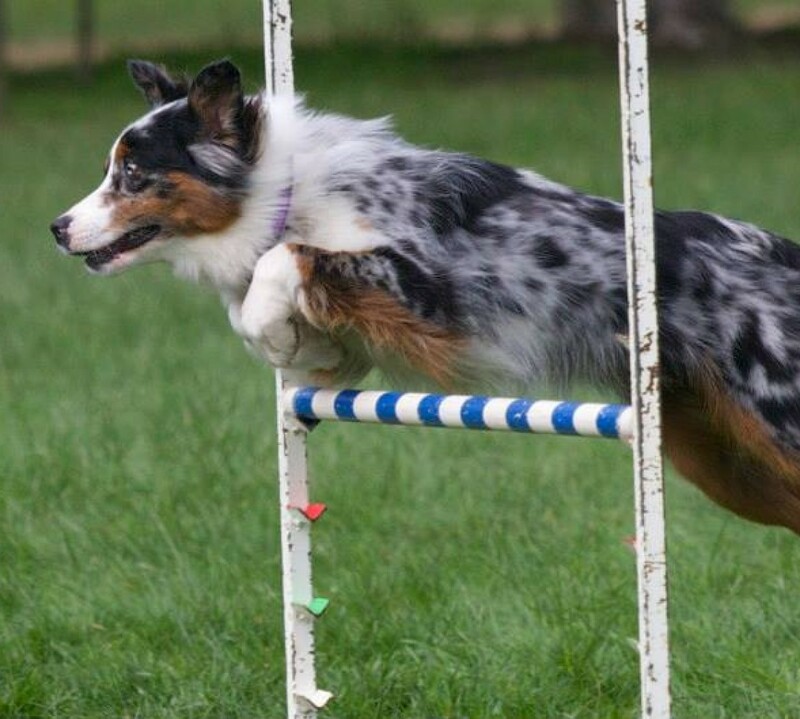 Think I’ll stick to agility, tracking and herding, thanks. Nic has a video of our turn so I might upload it later for you. 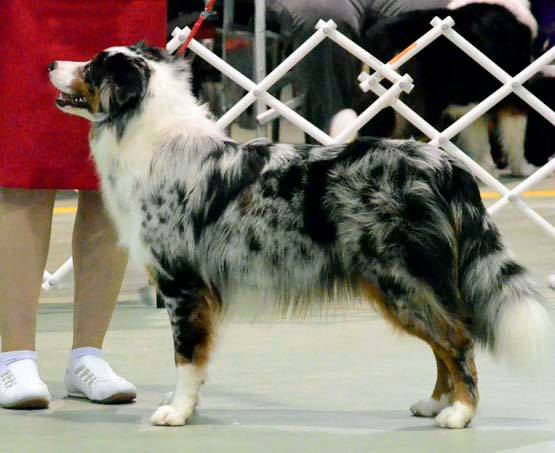 Here’s my clean show dog! On Sunday, Penny, Husband and I headed up to Tallarook again. We went for a lovely 3.5 hour hike through the bush mostly off-trail. Lumen continues to amaze me with her stamina. By the end of the walk we found this little dam and she just wanted to keep running and playing chase. Mal was so tired, but Lu could have just. kept. going. She’s a MACHINE. I can tell she’s a bit fatigued today so I didn’t train her, but took her to the dog park where she played very half-heartedly. Lumen found two dead-things while hiking and gave them up quite happily in exchange for kabana. Good girl. They went racing off on us once or twice but came back so I don’t know if they were chasing an actual thing, or a smell. I can see just how amazing this kind of walking will be re: Lu’s jumping thing, as she goes so quickly sometimes that she has to adjust her stride, has to leap running flat-out, has to coordinate herself at high speed over branches and sticks. Such amazing conditioning. Here’s one photo from yesterday’s adventures… you can have more in a gallery tomorrow. Wow, what a big weekend! 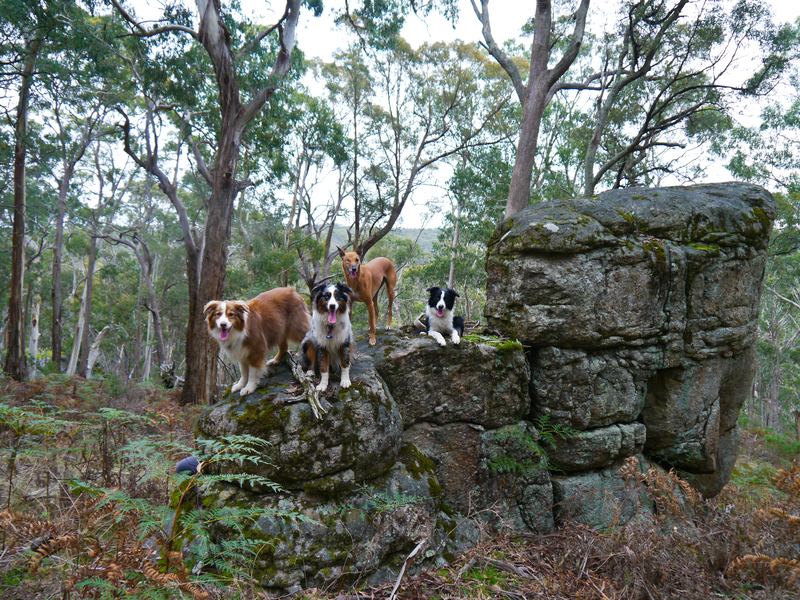 Saturday saw all four of us (Husband and dogs) head up north to the Tallarook State Forest. In Victoria, dogs are allowed in state forests, which are some of the only parks in Victoria that allow dogs… and I’ll put it this way: state forests are constantly logged for timber, and are a great hit with 4 wheel drivers and dirt/trail bike riders, who blitz through on tracks they’ve found/made… So, I guess the environmental damage that dogs make is as bad as trail bikes, 4WDs and loggers…since we’re not allowed anywhere else…But, at least it gives us some places to explore, assuming we’re careful with all the dirt-bikes zooming around. I write more about Free running later in the week, but essentially we went off-trail for a good 45 mins to an hour, and this was plenty to tire both dogs out – especially poor Mr. Mal, but even Lumen wasn’t zooming around by the time we got back to the car. All that leaping over branches, ducking under logs, sniffing, exploring, chasing and having to not trip over things certainly gives them a whole-body workout! Lumen (for once) settled down when we got home and slept happily.We’re planning on getting a map of the area because the forest is beautifully open compared to some we’ve been in, and there’s sections with big rocks and nice hills. Our next plan is for a longer day-trip with a picnic lunch somewhere. This morning Lu and I headed to the park to do some training and to try out a sequence from lesson 3, focusing on extension and collection in jumping. I thought Lu did really well and I was certainly puffing and out of breath by the end so I’m thinking I was running pretty hard! I noticed on the video that the last two times I did it she was drifting wide out of the turn so I think I’ll do tunnel-jump=jump-wrap to thrown toy closing the wrap. Might get her thinking about where her next obstacle will be- I suspect she’s drifting over to me so maybe I need to watch my distance from the jumps too and remember that she’s not Mal- I can’t work her at the same distance yet! There’s the video from today. This week I need to do some weaves and put a brick under my running-contact plank to start raising it. After all this we went to a property nearby where Husband and I have started volunteering- the woman there rescues and rehabilitates horses, but has broken her back and had cancer and so doing things around the farm is really tough for her. I miss riding and being around horses and it’s not far from us so we’re going down there when we have a free Sunday. I took Lu for the first time today (not Mal as they have a dog who isn’t very good with other dogs and Mal sometimes isn’t good with other dogs, although he is good with horses, which I wasn’t sure about with Lu, but I decided it would be easier to leave him this time.) Well, Lumen had a ball being a farm dog. She ate poo, rolled in something, thought she was driving and rounding up the horses (she was behind one when I started to lead it, and her face said: wait! Am I doing this!? I AM!!! GO HORSE! And when I stopped the horse she barked at it: MOVE ON!! GO HORSE!!! WHY WON’T YOU MOVE!!? She also barked at them when they neighed, and when they were running around. She had enough respect for them to not get up in their faces, but not enough sense to avoid them when they were running and being silly. She also hasn’t yet learnt about electric fences (I’m sure she will). She’s now one very worn out pup, but I must say she looked far too pretty to be a proper farm dog!